April | 2012 | What about this? Bending to the wind and rain, the rosebuds looked as if they were praying. The first bloom of the season is usually the best, but this year the roses in my garden tempted fate by making their first appearance during a storm. Days later, with the sun on my back, I walked through my garden and inspected the blooms. 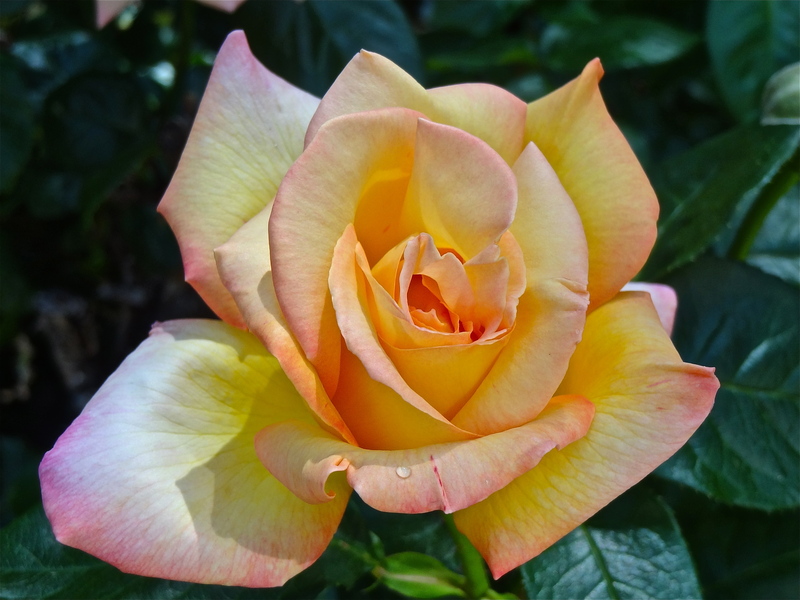 Several had irregularly-shaped petals and showed signs of water damage. Reflecting on these imperfections, I thought about the Japanese philosophy of wabi-sabi, where there’s perfection in the imperfect. With that in mind, these stalwart roses had to be some of the loveliest ones I have ever seen. Thousands of tiny figures support the weight of a man in a thought-provoking art installation titled Floor. Korean artist Do Ho Suh positioned the tiny figures, with their arms held upward, under plates of glass. Check out the rest of the photos first and then consider the artist’s message. Are you a glass-half-full or a glass-half-empty type of person? 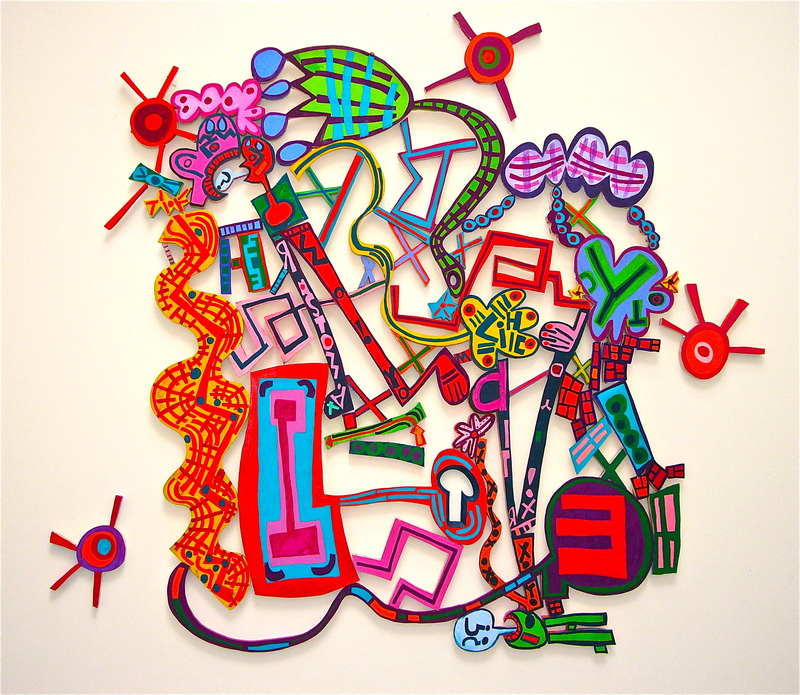 Do you think this piece represents support or oppression? #2 – Hold On To That Hose! 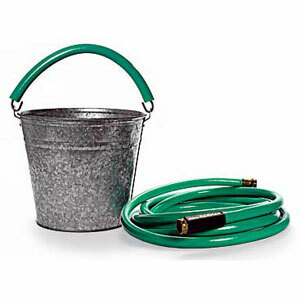 From This Old House comes this article 10 Uses For A Garden Hose. Here’s another 10 reasons why you should not throw out anything, at least if it can be reused! 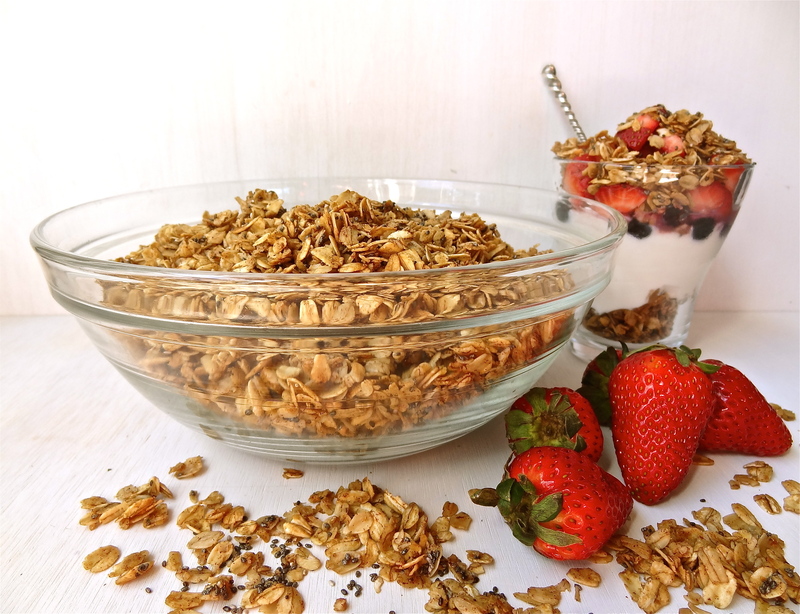 #3 – Spice Up Your Life! Herbs and spices bring flavor into our diets, but many spices do more than that. According to an article in Eating Well, the spices listed below are considered eight of the world’s healthiest spices. Read the complete article to learn about the benefits of each spice. Parsley, sage, rosemary and thyme . . . wait thyme’s not on the list? Some of my most creative thoughts, whether related to problem-solving or just ideas for projects and recipes, come to me when I am blow drying my hair. Having short hair, I’ve wondered if my creative productivity would increase if I grew my hair out. You know – the longer the hair, the longer it takes to dry. A wise friend advised me to write down everything I am grateful for every night before I go to bed. It keeps life in perspective. And in the morning, upon her advice again, I write down everything that’s in my head before I even get out of bed. She calls it the “Morning Dump,” where you dump out all the thoughts floating around in your head and you start your day fresh. Along the same lines, of being grateful and starting your day in the proper frame of mind, comes an article called How To Wake Up Every Morning On Top Of The World from the website Tiny Buddha. #5 – What Would Dorothy Say? There is no need to reach high for the stars. They are already within you. Just reach deep into yourself! This tree. This beautiful weeping cedar, a graceful perch for so many birds, is dying. It’s just a tree, I tell myself. But nonetheless, for over sixteen years, without any special wants or needs, this tree’s long, downward-growing branches covered with silvery, grey-green bursts of needles created an elegant archway into my garden. Now, it stands almost completely denuded. The arborist came last week, dug around, and shook his head while he uttered, “Probably some type of fungus. It’s a wait and see game, now.” Everyday, I go outside and look at this tree. I examine it for new growth – there is none. I touch the branches – needles fall slowly to the ground. 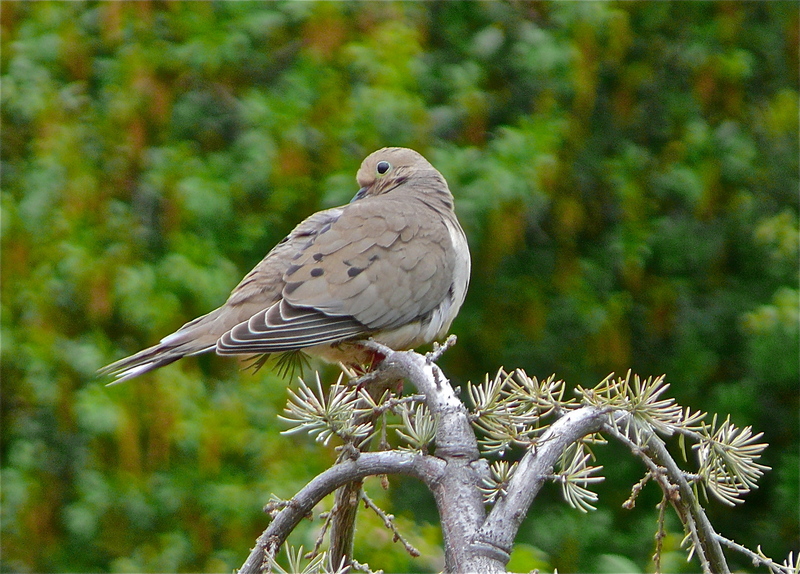 I scratch lightly at the bark to see if there is any green underneath it – there is. There is still hope for this tree. Planet earth is counting on creative people to save it. Smart concepts such as this “Urban Hotel” illustrate my point. 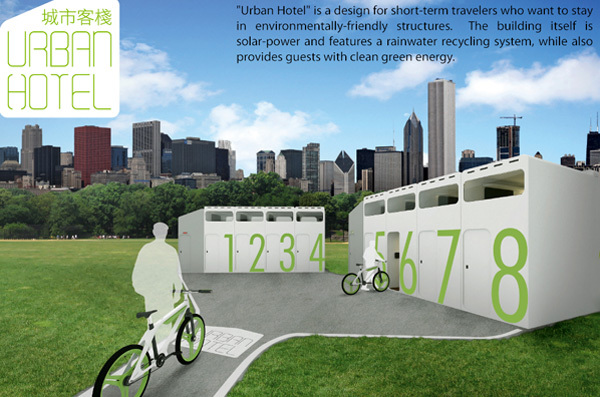 Although you would expect solar-power and rain water recycling systems in these hotels, a unique feature of this concept are the bicycles in the rooms. The bicycles can be used for exploring surrounding urban areas or used for exercising inside the rooms. While exercising, the bikes convert “the bike’s pedaling into kinetic energy to power the room and any extra energy is used to deduct rooming costs.” Make sure to click on the link to view all the features of this earth-friendly concept! My neighbor came to visit the other day and she brought with her two gift bags. One contained my birthday gift and the other one contained another kind of gift. The bag was filled with empty toilet paper tubes. 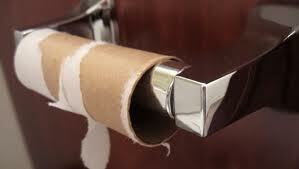 She remembered a comment I made about how I compost toilet paper tubes and paper towel tubes. After collecting several tubes, I cut them open, flatten them out and then feed them into my paper shredder. They add much needed “brown” organic material to my compost bin. There are many other items around the house that can be added to compost piles. TLC’s article on 75 Things You Can Compost, But Thought You Couldn’t is a good refresher course for those of us who compost. If you haven’t started composting, please consider it. It’s an easy way of redirecting some of your garbage away from landfills and back to the land. What do chefs do when they are bored? I don’t know the answer to that, but I would imagine they play with their food! 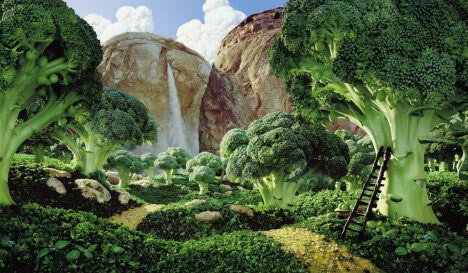 Check out this series of food art photos and see that creativity knows no bounds in the kitchen! What could be better than going shopping? What about shopping outdoors in the fresh air and sun? 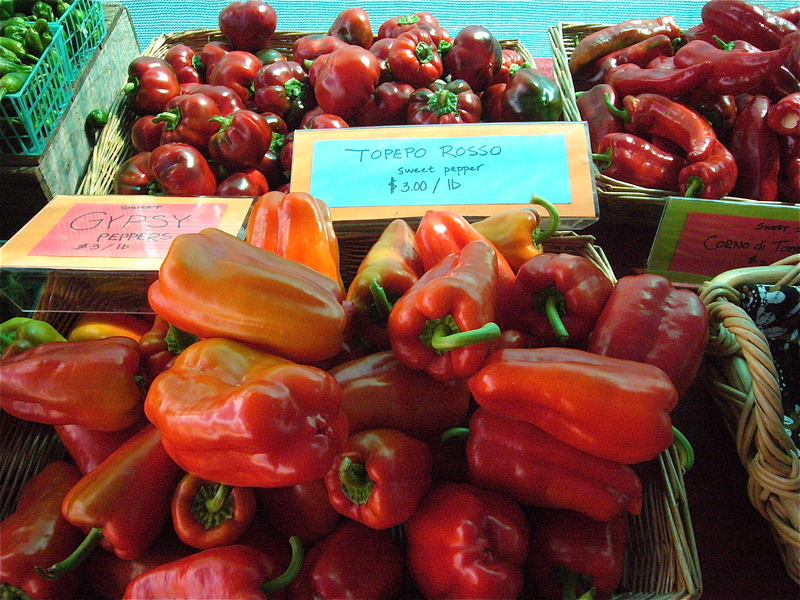 Most farmers’ markets carry more than just produce. I love walking up and down the rows of stalls looking at and sampling the fresh seasonal produce. I also enjoy visiting the stands that sell olive oil, soap, honey, hand-crafted and fresh baked goods, plants and flowers. I always make sure to bring my own bags/baskets, cash, and, of course, my camera. For more tips, visit Recyclebank’s 10 tips to Shop Smart at Farmers Markets. “Yes, but it’s always good to hear that somebody else thinks so, too,” he said. Happy Earth Day! What about this? Do one thing every single day that is good for the earth! The children’s counting rhyme “One potato, two potato, three potato, four . . . .” ran through my head as I wondered what to do with a five pound bag of tri-colored potatoes that my husband brought home after a quick run out to Costco. 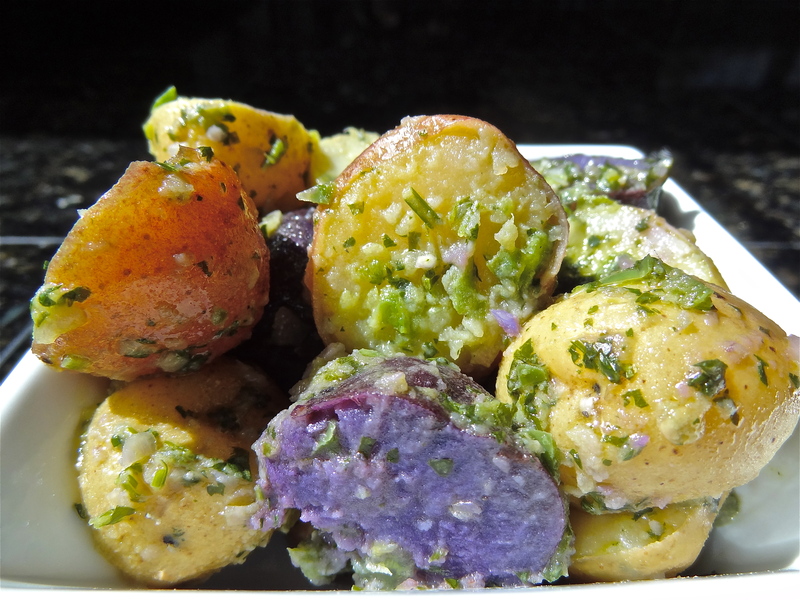 Small red, cream, and blue potatoes tumbled out of the bag as I prepared them for roasting. But before tossing out the bag, I looked at it and discovered a simple and seemingly low-calorie recipe, full of fresh flavors and a little bit of kick. Knowing that this potato salad would be a huge hit with my family, I changed course and turned off the oven! 1. Place potatoes in a large saucepan, cover with water and add salt. Bring to a boil and simmer potatoes until just tender, about 15-18 minutes. Potatoes will continue to cook after draining; do not overcook or they will break apart. 2. Drain potatoes and rinse under cold water until slightly cooled. Cut into bite-sized pieces while still warm and gently toss with 2.5 tablespoons vinegar. Continue to cool potatoes to room temperature. 3. While potatoes cook, coarsely chop jalapeños and pulse in a food processor with lime juice, cilantro, shallots, garlic, oil, and remaining vinegar until finely chopped. 4. When potatoes are cool, toss with pepper mixture and serve. 1. While searching for the exact recipe source, I found the potato distributor’s website and on it was the same recipe, but scaled back to serve 4 to 6 people. Here’s the link to that recipe. 2. Because the jalapeños I purchased were large and because I don’t enjoy the heat from peppers as much as the rest of my family does, I only added 2-3 jalapenos. 3. To make this recipe gluten-free, make sure to use an olive oil that has been manufactured without contamination from any wheat products. Bariani and Bertolli have been mentioned on a Celiac.com online thread as safe brands. In addition, cider vinegar is considered safe, but know that not all vinegars are gluten-free. Cradled in the arms of trees, the moon rested. Stars and planets hovered subserviently nearby, knowing that the bright light emanating from the full moon dimmed their own magnificence. But, if the truth be told, the moon didn’t want to stand out – he longed to be in the night sky clustered together with the others. He was lonely, but not alone. 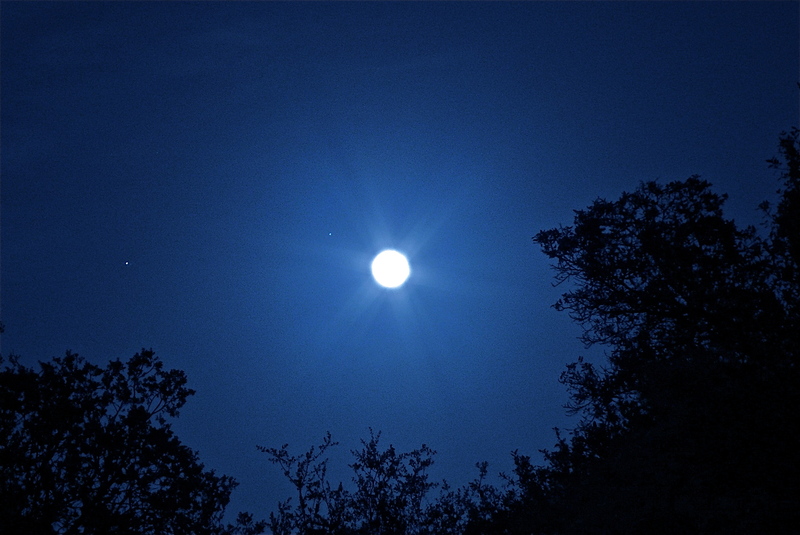 As the night evolved and the moon rose, he dimmed his light a bit and the stars twinkled with appreciation. The moon’s lesson: it’s not as important to be on center stage as it is to share the stage with others. 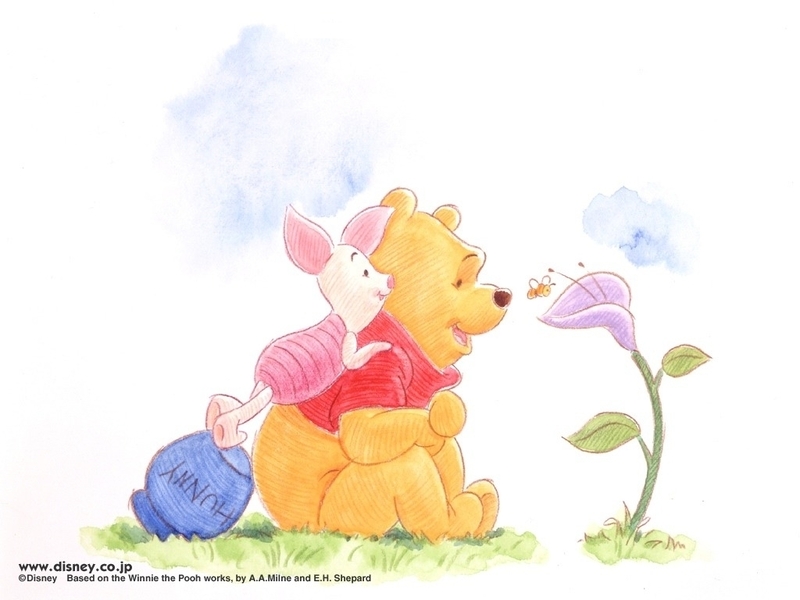 And, with a little help, others can have their moments to shine. Imagine what it’s like to view the earth from the moon. How majestic and pristine our planet must appear from afar. Celebrate our planet on Earth Day, April 22nd. 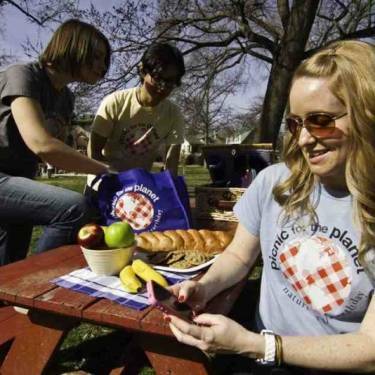 The Nature Conservancy plans on celebrating by organizing a record-setting picnic. If you’d like to be part of the Conservancy’s attempt to set a Guinness World Record for the most people picnicking in 24 hours or if you want to learn different ways in which you can help our planet, click here. #2 – Photograph or Painting? 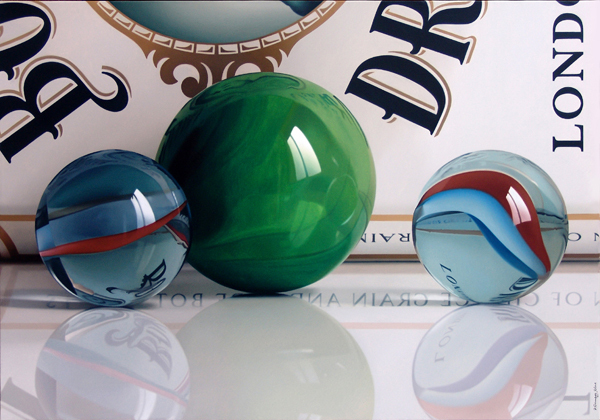 I would be over the moon if I had the talent and patience to paint like Pedro Campos! Using oil paints, the Spanish artist creates amazingly realistic still life paintings that are often mistaken for photographs! Check out his website to view more of his incredible artwork! Stars twinkle and the moon glows in this DIY project. 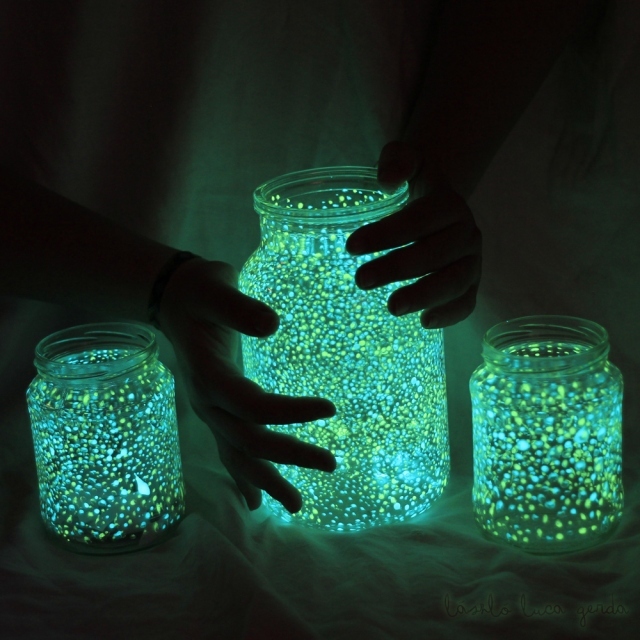 Mason jars are painted or “dotted” on the inside with glow-in-the-dark paint. They are allowed to dry and then are charged with sunlight or lamplight. I fell in love with these jars when I first saw them and they are definitely on my “to do” list! #4 – Brain or Moon? From mental_floss comes this quiz that tests your familiarity of moon and brain nomenclature. For example, is the Dorsum Scilla a part of the brain or a part of the moon? Look at the moon this weekend and have fun making up your own story about it! From my new magazine comes this appetizer version of a classic banh mi, a Vietnamese sandwich. Banh mi sandwiches usually require a light crispy baguette, some type of meat, cucumber strips, jalapeño slices, cilantro sprigs, and pickled daikon and carrots. This simplified version is an easy and delicious way to use up some of your leftover Easter ham! 1. Preheat broiler. Spread one side of each bread slice with mayonnaise. Place bread slices, spread sides up, on a baking sheet. Broil 4 to 5 inches from the heat about 1 minute or just until starting to brown. Brush lightly with soy sauce. Broil for 1 minute more. 2. 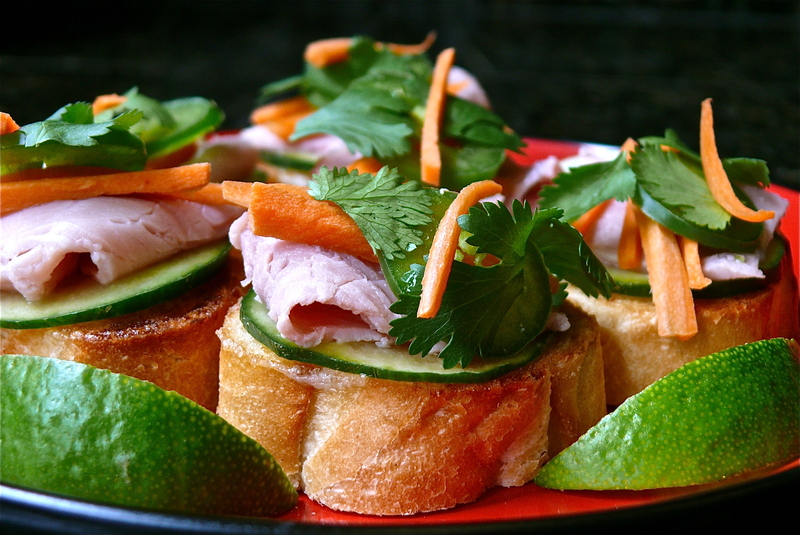 Top bread slices with ham, cucumber, carrots, and cilantro. 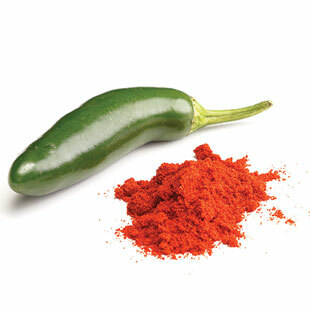 If desired, garnish with jalapeño slices and serve with lime wedges. 1. To make this appetizer more like an authentic banh mi, make up a batch of pickled daikon and carrots and use it to top the mini banh mi stacks. 2. There’s no need to measure out the mayonnaise. Using a spatula, just spread it directly from the jar onto the bread. You’ll find that you’ll use less than the 1/3 cup called for. 3. Carrots should be coarsely grated or julienned. 4. If whole slices of jalapeño seem too spicy for you, cut the peppers into strips or coarse chop them. I wear rubber gloves (designated for food prep only) when I cut peppers. Hot chile peppers have oils that can burn your skin and eyes, so make sure you wash your hands with soap and water after working with them! Ever have one of those days? Years ago I snapped this photo of a colorful art installation at the Biennale in Venice, Italy. When I accidentally came across the photo today, I thought to myself, “It’s an illustration of how I feel at this moment.” All my jumbled thoughts are somehow perfectly tied together! #1 – What Can You Do With Adhesive Tape? Numen/For Use is an artist collective that designs art installations using common everyday objects that are uncommonly used for art media. Using an untold number of rolls of tape, the collective created a huge spider-web-like art installation that spans buildings in Melbourne. Check out these incredible photos and a brief video of Tape Melbourne. If you’re grilling asparagus this weekend, here’s a little tip for you. Soak some long bamboo skewers in water for about 30 minutes. 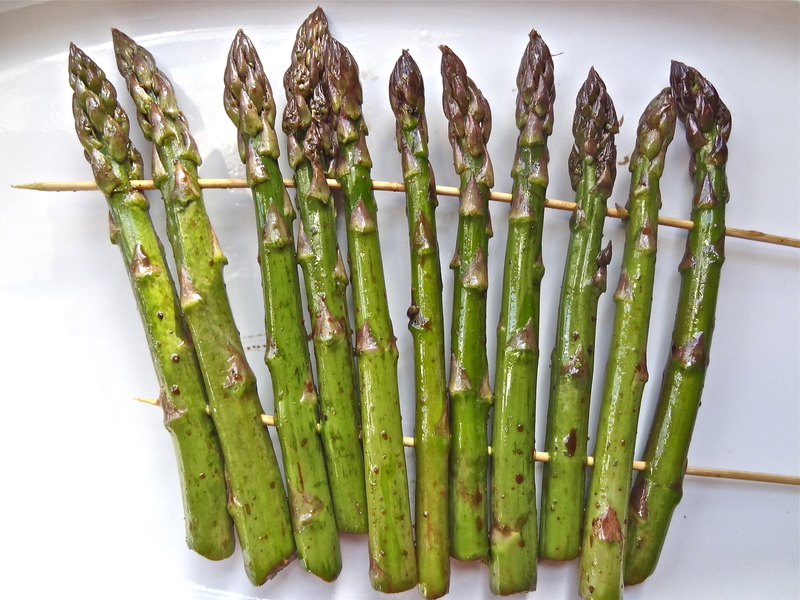 Using 2 skewers at a time, skewer asparagus spears through top and bottom for easier handling on the grill. Now they’re a breeze to flip over! The photo below shows them before they were grilled. I washed and blotted dry the spears and then tossed them with olive oil, a little balsamic vinegar, garlic salt and freshly ground black pepper. Delish! At first glance, 30 Things to Start Doing for Yourself may seem like a long read, but, in actuality, the themes are familiar to most of us already. The list is a great refresher course on how to get the most from our lives. I enjoyed reading all 30 entries, but number one really spoke to me: Start spending time with the right people. – These are the people you enjoy, who love and appreciate you, and who encourage you to improve in healthy and exciting ways. They are the ones who make you feel more alive, and not only embrace who you are now, but also embrace and embody who you want to be, unconditionally.